For the third time we've spent a January weekend in Glasgow for the Celtic Connections festival. Two gigs stood out. First, on Saturday night was Bothy Culture and Beyond. 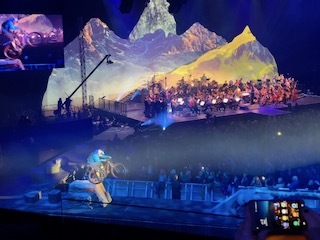 If the 80-piece GRIT orchestra recreating a seminal Scottish electronic dance album isn't enough, why not add a 10-voice cantor choir, an aerial dance company, and a trials cyclist rowing across the audience before bunny-hopping round the crowd before climbing a model of the Cuillin's Inaccessible Pinnacle in front of an 10,000-strong crowd at Scotland's largest indoor venue? I've not mentioned the metaphysical Gaelic poetry; the Islamic, Scandinavian and Irish musical influences; or the stunning support set from Skye-based techno/trad band Niteworks. Jaw-dropping, indescribable and utterly bonkers. You owe it to yourself to watch the gig after it's broadcast this coming Saturday night. The second highlight was an altogether different scale. 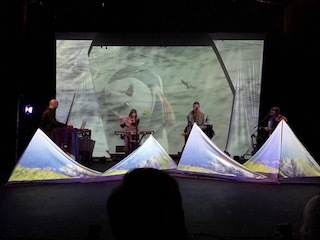 In the intimate Tron Theatre Northern Flyway brought together harmonious, ethereal music with beat-boxing and stunning videography against a continuous backdrop of birdsong. It'll tour in the Autumn; don't miss it. Over the weekend I realised: this is why we're moving to Scotland; you simply don't get this level of innovation in the arts elsewhere. Hopefully we'll be able to visit Celtic Connections 2019 by at most a forty-mile train journey instead of the four hundred miles we travelled each way on the sleeper this week. Welcome to 2018, hopefully the year in which we finally make the big move we've been talking about for years. We're sorry that this blog has been quiet for most of 2017. We'll fill in the gaps later, but for now we're preparing for the Big Adventure. Step one starts this week: sell the house.